"Beautiful cover, and she looks great in that dress." 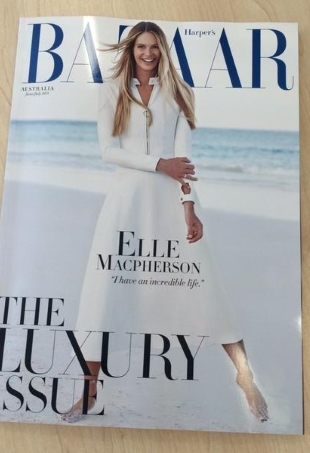 Harper's Bazaar Australia tapped Elle Macpherson as its June/July 2015 cover girl. Anne Hathaway, Amanda Seyfried, and Taylor Swift also top this week's list. Our editor-at-large caught up with one of People’s “Most Beautiful People” to do a little purse diving. The former supermodel was classically chic in a white Ralph Lauren suit.